The Instrumental Music Program is participating in the Spring Booster Raffle. We are asking that each student sell two tickets at $20 each. After those two tickets, all proceeds from further tickets will go to the individual student accounts. Ticket stubs and purchase money are due back to the black box by February 1st. The drawing will take place February 3rd. Tickets were distributed to the students last week. If you have questions or need more tickets, please contact Sarah Bartels Nagel. What a great weekend at our Orchestra Winter Retreat! No snow this year, but plenty cold! The chill, however, did not keep us from having an amazing time! Bonding games, sectionals, great food, zip lining, warm cabins, rehearsals, archery, s’mores, and basketball are some of the fun things that happened. I would like to thank the parents for your overwhelming generosity in the snacks department! I would also like to give our chaperones, Patricia Quon, Yvonne Lim, Mamiko Toda, Nancy Hong, and Mona Kim an enormous thank you for being awesome chaperones! You all helped make the Winter Retreat a big, big success! Now… California Adventure this Wednesday! The fun never stops! Mamiko Toda made a video of the Winter Retreat. Check it out so you can get a feel for our amazing weekend! All traveling members (students and chaperones), and any parents who want to receive text info prior to and during the trip, need to join the “Travel Buddies” Remind. Send a text to 81010 with the message, “@lchstrip” to join. Mr. Stone will be giving updated information prior to the trip and important information while in Ireland. We will be using google classroom for the trip… Traveling students ONLY should join (class code: u8o5tcc) and upload a photo or scan of your passport (just the photo page) to the assignment already assigned. Please upload by February 1st. Chaperones do not need to upload. There will be an Ireland trip meeting for all students and parents traveling to Ireland on February 12th at 7pm in the Band Room. Rules, responsibilities, and packing issues will be discussed. See you there. “Disneyland weeks” have arrived! I love to go and perform in such a great place with appreciative audiences and show off the talents of our great students. The smiles we see as we march by the crowds lining the streets and the people who pause to listen to the orchestra in their pursuit of the next ride, all give a wonderful feeling to our performances and make the day that much cooler. Oh… and then there’s the fun of the rides! It’s a nice day of school! Thank you to all our parent chaperones who make it that much smoother and an easier day! Have a great week and enjoy all the fun and music around you! This week we have Concerto Concert auditions and the Winter Retreat! Please read and review all the information. Have a great week! The 9-12 Orchestra Winter Retreat is this coming weekend! We will be at Angeles Crest Christian Camp, located at 20075 Angeles Crest Highway. It is about an hour’s drive north of La Canada at about 6,000 feet in elevation. The weather is looking to be sunny, and probably no snow. Please note: There is no cell service and no wifi for campers. The office number, in case you need to reach your student in an emergency is: 626-449-3339. We will travel to the camp on buses and will leave from LCHS directly after school on Friday, January 19th. Your student can bring their gear to school in the morning to be stored in the band room for the day. We will leave LCHS at approximately 4pm, arriving at the camp at about 5pm. After a weekend of music and camp activities, we will arrive back at LCHS at approximately 1:30pm on Sunday, January 21st. If you haven’t already, the waiver form and fee of $185 is due. Please make checks payable to, “LCHS MPA,” and have your student return the form and the check to the black box in the band room. The snack sign-up was sent by separate email last week, but we’re still looking for some snack donations. Please click on the link and sign-up! The kids will be having rehearsals as well as time in the outdoors which means that they will be HUNGRY in between meals! We will have s’mores, a nacho bar, popcorn, hot cocoa, whole fruit, and other assorted goodies. There are several students with nut allergies, so please send snacks that are NUT-FREE. Have your student bring a reusable water bottle for the duration of the trip. We don’t want them to get dehydrated up in the mountains and we will not be stocking very many disposable water bottles. They will be able to fill up with good, clean water at the campsite. All snacks need to be individually wrapped. 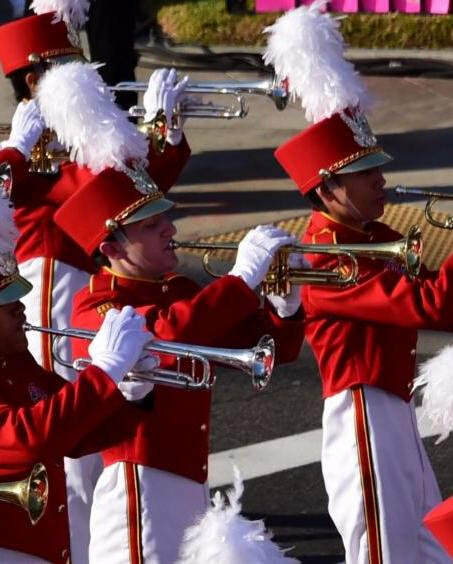 Henry Vaughn — a Junior, and a Trumpet player in the LCHS Band — auditioned for and was selected to march with the PCC Tournament of Roses Honor Band. He marched with them — all six miles down Colorado Blvd. — at the 2018 Tournament of Roses Parade. Congratulations! All Instrumental Music students are invited to audition. Each student will need an accompanist and the piece does not have to be memorized. If you’re interested in auditioning, please click here to sign up. The mid-point of the school year gives one the opportunity to look back and see what has been accomplished, and to look forward to the possibilities of what can be accomplished. I feel the Orchestra has accomplished much in the way of students’ individual playing skills being improved. This is a great development because it means that each person in Orchestra will be able to play, contribute, and enjoy their musical experience! We have much to look forward to: Winter Retreat, Disneyland, Concerto Concert, etc. I am looking forward to a fantastic semester full of fun and good music-making! Happy New Year! I hope everyone is rested and staying clear of whatever plague/sickness that has descended upon the Stone household. I’m looking forward to a new semester, new music, and new experiences as we begin 2018! Make sure you all mark your calendars for upcoming concerts in order to see these amazing kids perform what they’ve been working so hard for. Winter Guard and Drumline are in full effect rehearsing, Jazz Band begins night rehearsals, the ever-present musical is rapidly approaching, Festival is around the corner, Ireland is in the distance, and Orchestra is heading on retreat in a week. Very exciting things afoot in the Instrumental Music Program. Thank you all in advance for your constant support of the program. I’m looking forward to seeing you all at the Dinner Show!